Premier blue chip John Keells Holdings PLC (JKH) has begun the 2018/19 financial year (FY) with a dip in profit, reflecting challenging economic conditions to several of its core sectors, though few others remained resilient to improve their bottom line. JKH's Group profit before tax (PBT) at Rs. 2.91 billion in the first quarter of the financial year 2018/19 was down 29% from a year earlier. The profit attributable to equity holders declined by 23% to Rs. 2.19 billion. The last time JKH suffered a dip in 1Q was in 2013/14 FY. The sectors which recorded improved profits were transportation and financial service, whilst the leisure sector suffered a pre-tax loss of Rs. 278 million, and the property sector saw a post-tax loss of Rs. 5.8 million, though at pre-tax level it managed a Rs. 9 million profit. Consumer food and retail sectors saw decline in profit. The Group revenue however grew by 12% to Rs. 30.16 billion. In FY17 1Q. Group profit before tax was up 14%, and profit attributable to equity holders saw a 19% growth. 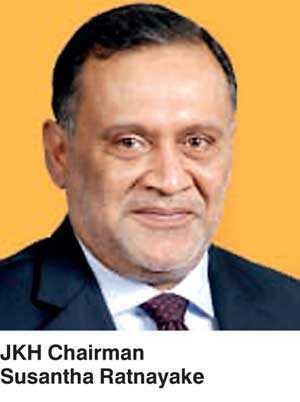 In full year of FY18, JKH reported its best-ever results with pre-tax profit up 21% to Rs. 27.6 billion, and post tax by 28% to Rs. 23.2 billion. Net profit attributable to equity holders of the parent was up 29% to Rs. 21 billion. Group revenue rose 14% to Rs. 121.2 billion. In 1Q of FY19, JKH has amended the reporting structure of its businesses where the Consumer Foods and Retail industry group was segregated into two separate industry groups. Additionally, the Group’s Office Automation business, which was previously under the Information Technology industry group, was classified under the Retail industry group, given the retail nature of its operations. The remaining businesses under the Information Technology industry group were included under ‘Other’, including Information Technology and Plantation Services industry group. Following is a snapshot of JKH's sectoral performance provided by Chairman Susantha Ratnayake. The Transportation industry group PBT of Rs. 842 million in the first quarter of 2018/19 is an increase of 4% over the first quarter of the previous financial year [2017/18 Q1: Rs. 807 million]. The increase in profitability is mainly attributable to the performance of the Group’s Bunkering, and Ports and Shipping businesses. During the quarter under review, the Port of Colombo witnessed a year-on-year growth of 15% whilst South Asia Gateway Terminals (SAGT) recorded a growth in throughput of 25%. Profitability of the Group’s Bunkering business, Lanka Marine Services (LMS), increased as a result of a volume growth of 20% and improved margins. During the quarter, LMS commissioned ‘MT Amelia’, further enhancing LMS’s overall storage capacity and delivery efficiency. The Logistics business recorded a strong performance due to an increase in throughput in its facilities. The Leisure industry group PBT at negative Rs. 278 million in the first quarter of 2018/19 is a decrease over the first quarter of the previous financial year [2017/18 Q1: Rs. 179 million]. The decline is mainly attributable to the lower profitability in our city hotels and a non-cash impact of Rs. 202 million, which was recorded at ‘Cinnamon Hakuraa Huraa Maldives’ on account of an impairment loss on non-financial assets arising from the closure of the hotel for re-construction. In addition, ‘Ellaidhoo Maldives by Cinnamon’ is partially closed for on-going refurbishment, which has impacted occupancy. Whilst the City Hotels sector recorded an improvement in average room rates, profitability was impacted by a decline in occupancies, primarily as a result of the increase in room inventory within Colombo in the calendar year 2017. However, the year-on-year total number of room nights occupied in the city increased by 6%, demonstrating the steady absorption of new room capacity. With new capacity expected to come on stream over the next few years, especially into the city, it is important for the country to improve its overall tourism product and entertainment offering to attract the higher spending tourists. In this context, Cinnamon Life, with its unique offering, will lead the repositioning of Colombo as a high-end destination. The Sri Lankan Resorts segment recorded an improvement in occupancies despite the increased competition within the sector. The Maldivian Resorts segment recorded an improvement in average room rates, although profitability was impacted by lower occupancies and the partial closure of ‘Ellaidhoo Maldives by Cinnamon’ for refurbishment. However, occupancies at the hotels in the Maldives remained above the industry average during the quarter under review. The Property industry group PBT of Rs. 9 million in the first quarter of 2018/19 is a decrease over the first quarter of the previous financial year [2017/18 Q1: Rs. 62 million]. The decrease in profitability is mainly attributable to Rajawella Holdings Ltd., which is currently undergoing a relaying of the fairways. The construction of Cinnamon Life is progressing with encouraging momentum, with approximately 62% of the floor area sold in the two residential towers. Tender submissions for the Tri-Zen residential development project are expected to be received in the ensuing quarter, whilst presales continue to be encouraging. In addition, the master planning of an 18-acre suburban site North of Colombo is also currently underway. The Consumer Foods industry group PBT of Rs. 339 million in the first quarter of 2018/19 is a decrease of 46% over the first quarter of the previous financial year [2017/18 Q1: Rs. 627 million]. The decline in profitability is on account of the Beverages business which recorded a volume decline of 37%. This is due to the implementation of a sugar tax from November 2017, which resulted in substantial price increases across the industry. As a part of our continuing strategy to reduce and replace calorific sugar content in the carbonated soft drinks (CSD), the ‘GO Sugar Free’ range was launched during the quarter under review. The sugar free CSD variants currently accounts for approximately 23% of total beverage volumes. In furtherance of the Beverage business’ strategy to diversify its portfolio to create a more balanced mix of CSD and non-CSD variants, the business launched dairy and water products in April and June 2018, respectively. The dairy range, launched in Vanilla, Chocolate and Strawberry flavours under the ‘Elephant House’ brand has been very well-received. The Frozen Confectionary business recorded a volume growth of 3% during the quarter under review. Colombo Ice Company Ltd. (CICL), the newly constructed Frozen Confectionery plant in Seethawaka, commenced operations in June 2018. In addition to its scalability and operational efficiencies, the facility will enhance the scope and the portfolio of the business, mitigating the need to import impulse products at a higher cost. As such, the production of impulse products domestically will further improve margins of the business and availability of products. Keells Food Products PLC recorded an increase in profitability on account of a 12% growth in volumes and prudent cost management initiatives. The Retail industry group PBT of Rs. 235 million in the first quarter of 2018/19 is a decrease of 51% over the first quarter of the previous financial year [2017/18 Q1: Rs. 483 million]. Whilst the Supermarkets business continued to record a growth in customer footfall, which contributed positively towards a year-on-year growth in same store sales, profitability was impacted by depressed basket values due to weak consumer sentiments and store expansion-related costs. During the quarter under review, two new outlets were opened, bringing the total store count to 82 as at 30 June 2018. The new store branding initiative is well underway with 20 stores in conformance as at 30 June 2018. All existing outlets are expected to be refitted and rebranded by November 2018. The new format and offering continues to be very well received. The planned outlet expansion is on track, with a number of sites identified. The Office Automation business maintained profitability despite significant exchange losses during the quarter under review. The Financial Services industry group PBT of Rs. 550 million in the first quarter of 2018/19 is an increase of 131% over the first quarter of the previous financial year [2017/18 Q1: Rs. 239 million]. The increase in profitability was primarily due to Union Assurance PLC, driven by a growth of 13% in gross written premiums. Nations Trust Bank recorded an improvement in performance driven by steady loan growth during the quarter under review. Other, including the Information Technology and Plantation Services sectors recorded a PBT of Rs. 1.21 billion in the first quarter of 2018/19, which is a decrease of 28% over the first quarter of the previous financial year [2017/18 Q1: Rs. 1.69 billion]. The decrease in PBT is mainly attributable to the decline in finance income due to a lower capital base at the Company compared to the corresponding quarter of the previous financial year. The performance of the Plantation Services sector was impacted by a decrease in tea prices during the quarter under review. The profitability of the Information Technology sector in the first quarter of 2018/19 is lower when compared to the corresponding quarter of the previous year, which included profits of the Group’s BPO business, which was divested in September 2017.